According to Lizzy Stemke, good defensive posture includes shoulders in front of knees, bellybutton behind the ball, hips under the ball, shoulders rounded and arms at a good angle. 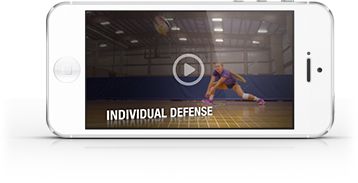 To work on defensive posture and forward momentum, Stemke has two players start under the net in a forward-leaning defensive posture. Remaining players form two lines behind them. A coach tosses a ball in front of each player. The players catch the ball, release it quickly, collapse to the floor and get back in line. Players progress to actually digging the ball. To work on an offensive approach to defense, Stemke has players start under the net, shuffle back, drive forward, play the ball and collapse to the floor.